This is a conditional contract - the entire deal is under contract and both sides are bound - subject only to one or more conditions being met. The most usual condition is a grant of planning permission. This is a conditional contract for land or property - once signed, the entire deal is under contract and both sides are bound subject only to one or more conditions being met. A conditional contract is an alternative to a property option agreement. An option places the optioner (usually the buyer) in control of the situation and the deal. A conditional contract provides a more certain situation in that the land owner knows he has sold subject only to the condition being met. The most usual condition is a grant of planning permission. You can edit the template easily for any other condition or multiple conditions. This agreement also gives you an option for the seller to require an additional payment in the future. This provision gives a seller a stronger incentive to sell when he thinks that the buyer may be able to generate more value later. For example, if the buyer cannot obtain planning permission for the whole site and instead seeks planning permission in stages, the seller can benefit from the increase in value of the land as a result of the subsequent grants of permission. We suggest that a buyer should keep this provision in reserve and not offer it unless demanded. Using a conditional contract should be preferred over an option agreement when both sides are able to weigh the chance of the condition being satisfied. A conditional sale is “done and dusted” apart from the condition. This agreement is a complete contract for the sale of land. When signed, both sides are committed to its terms. It does not require a separate or additional document other than the final transfer document for which you will require a solicitor. While the contract is open, the seller accepts restriction over actions which could adversely affect the condition or value of the land to the buyer. 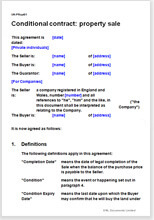 In case the seller is a limited company, the buyer can ask the director to guarantee this contract personally.